James Arthur Ray has pleaded not guilty to manslaughter charges. (CNN) -- The bail for the so-called "sweat lodge guru" facing manslaughter charges has been drastically reduced, his lawyer said. 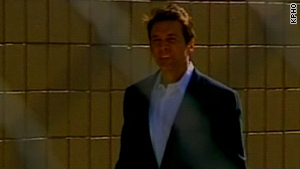 James Arthur Ray's bail was cut from $5 million to $525,000, Lui Li said Thursday. "We are pleased that after all the facts were presented Mr. Ray's bail was reduced," Li said. "Mr. Ray looks forward to his day in court." The self-help guru pleaded not guilty Thursday to manslaughter charges in the deaths of three participants at an Arizona sweat lodge ceremony he organized last year. As many as 65 people, ranging in age from 30 to 60, attended Ray's "Spiritual Warrior" program in October at the Angel Valley Retreat Center near Sedona. They spent up to two hours inside a dome-like structure called a sweat lodge, which was covered with tarps and blankets, and had hot rocks and water inside to create steam. The charges stem from the deaths of Kirby Brown, James Shore and Liz Neuman. Ray's lawyers say their client took the necessary safety precautions during the program, such as hiring nurses and other medical professionals trained in cardiopulmonary resuscitation to monitor the sweat lodge inside and out. "This was a terrible accident, but it was an accident, not a criminal act," Li has said.